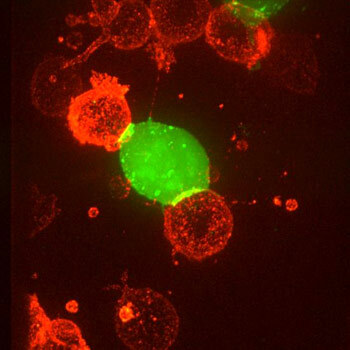 HIV virus particles produced in an infected cell (green) concentrate at cell junctions with uninfected T cells (red). Anti-viral therapies can suppress the high concentration of particles at these cell contact sites and prevent development of AIDs, a new study by Yale researchers has shown. New research from Yale University reveals that cell-to-cell transmission of HIV particles contributes to the development of full-blown AIDS and helps predict which anti-retroviral therapies will be most effective at keeping the disease at bay. The new research reinforces recent findings that a heavy concentration of the virus at the point of contact between cells is crucial to the development of AIDS. The study also suggests that earlier findings that anti-retroviral therapy fails to suppress HIV at cell junctions might be premature. In their new exhaustive analysis of 16 anti-retroviral drugs researchers showed that 13 are effective. Three drugs were effective chiefly reducing viral levels of free-floating HIV, but they fail to suppress HIV spread from cell to cell. However, researchers found that if two of the three that fail are combined they also suppress the spread of HIV, explaining why existing combination anti-viral therapies are effective. Senior author Walther Mothes, associate professor of microbial pathogenesis, said the effectiveness against highly concentrated HIV should be tested by companies developing more powerful therapies to combat AIDS. Be the first to comment on "Study Reveals Combination Therapies That Combat HIV at Cell Junctions"